New Balance Fresh Foam Zante v4 are neutral performance running shoes. 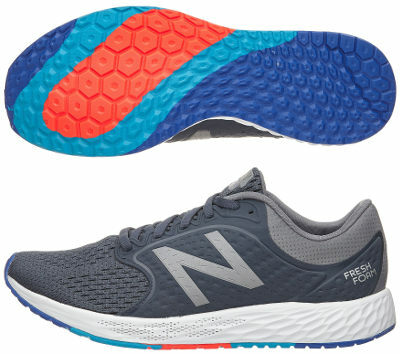 The fantastic New Balance Fresh Foam Zante v4 adds latest Fresh Foam™ developments to offer more uniform response and softer cushioning to consolidate great sale numbers as versatile running shoe at fair (or at least not exorbitant) price. Featuring all-round 6 mm drop with less classical frame than category's topseller Adidas Adizero Boston 6 and more affordable than disruptive Saucony Freedom ISO are the most important keys of its well deserved success. One of the most visible change compared with its predecessor Fresh Foam Zante v3 is the revamped upper which premiers new HypoSkin fabric embracing midfoot that promises to adapt better although raises some concerns about breathability despite multiple laser cuts. Bootie construction provides great comfort without risk of chafing while big "N" on both sides is made of reflective material to increase visibility under poor light conditions. There is no official numbering from New Balance regarding changes in its flagship compound Fresh Foam™, but it no secret that its configuration has been engineered (including small holes in forefoot) depending on the area in current Zante v4 to improve both sock absorption and stability to feature smoother transition and overall performance improvement. Outsole also has received minor updates in lug design to improve traction and it reminds the one in premium Fresh Foam 1080 v8 but without impressive transversal grooves in forefoot.